We are all very excited to hear the news that ground has been broken for the new building for Cardiff Catalysis Institute (CCI). Many of the team are involved in final design questions for the labs, offices and the lecture theatre. But while we wait for the new facilities to arrive CCI activities continue. This week a symposium jointly sponsored by Johnson Matthey and the CCI was organised on 3rd October to remember Dr Peter Williams who sadly passed away in 2012. Peter was involved in catalysis from his beginnings as a surface scientist at Cardiff, through to manager of the industrial manufacture of commercial catalysts with Johnson Matthey. 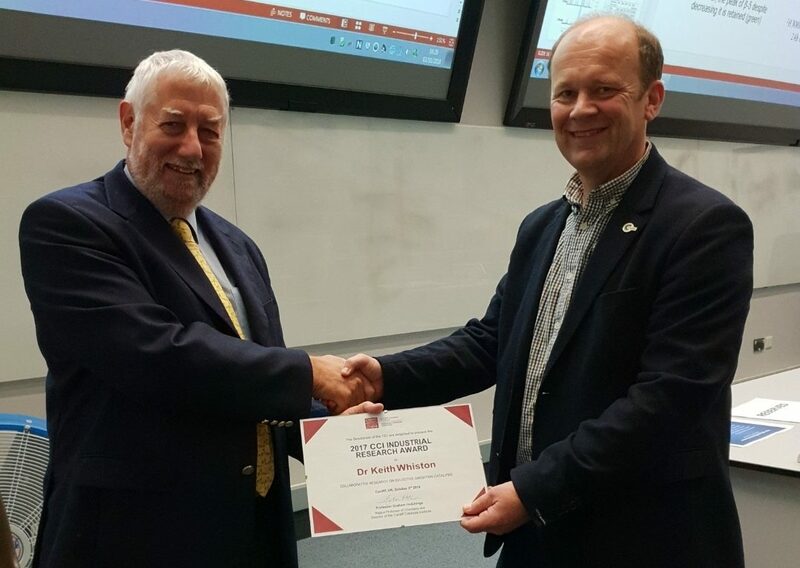 In honour of Peter’s links with Cardiff and his passion and drive with industry, Johnson Matthey graciously funds travel bursaries every year for Cardiff PhD students to attend a conference of their choice. 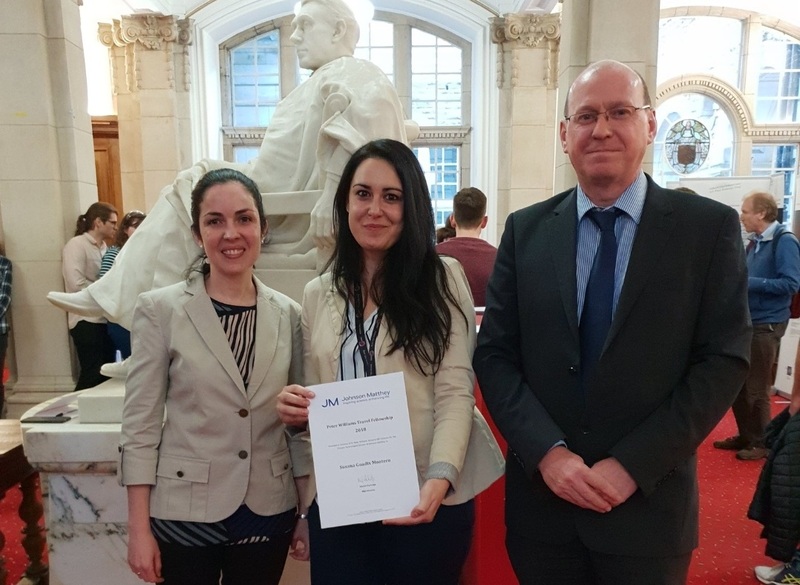 This year there were two recipients for this award, Nia Richards and Susana Guadix Montero, both final year PhD students, both gave talks at the symposium. 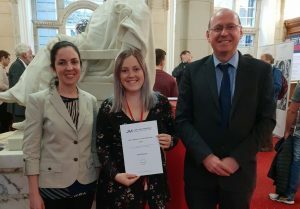 Nia Richards who used her bursary to attend TOCAT8 (Tokyo Conference on Advanced Catalytic Science and Technology) in Japan in August presented her work on the nature of the iron in Fe-ZSM-5 catalysts and how this affects the activity of N2O decomposition – a hugely important greenhouse gas. Susana used her bursary to attend EuCheMS (European Chemistry Society Chemical Congress in Liverpool) and gave a wonderful talk on the catalytic cleavage of C-C Inter-unit linkages in Lignin Model compounds – a possible pathway to using biomass for fuel and chemical feedstocks. Nia and Susana were joined in presenting by Prof Phil Davies from Cardiff who studied with Peter in Cardiff during his PhD and spoke about Peter’s enthusiasm for science and research. Phil’s talk also touched on the theme of reducing our impact on the environment with “Closing the Chlorine Cycle”. The Johnson Matthey lecture was given by Dr Monica Garcia who presented R&D at JM with particular attention to methanol synthesis catalysts which have been developing over decades. A special feature of the memorial symposium was a presentation by Dr Keith Whiston from Invista who was awarded CCI Industrial Prize 2017. The CCI has always had a very strong interaction with industry, something the Translation Research Facility (TRF) will facilitate by providing facilities to undertake research much closer to industrial conditions. Keith’s talk was a fascinating review of just how different industrial catalysis is from what goes on in the laboratory. He also set out the current “Grand Challenges and Opportunities in Petrochemical Catalysis’’ providing a road map for future research. It was an excellent afternoon with talks from different areas of research and wonderful insights into Peter’s legacy as a researcher, mentor, leader and a friend.